Script Pipeline discovers and develops writers for film and television, connecting them to producers, agents, and managers. Since 1999, several produced films and over $7 million in screenplay and TV pilot spec sales are credited to Script Pipeline’s unique, intensive process of long-term writer-to-industry facilitation. Contest finalists and “Recommend” writers work with Script Pipeline executives year-round, getting broader exposure in addition to continuous, one-on-one development assistance. Tripper Clancy, winner of the Script Pipeline Screenwriting Contest, sold the road comedy The Ambassadors to 20th Century Fox and the pitch Winter Break, and was previously on board the comedy Stranded for Sony. Tripper is writing Hacker Camp for Hasbro and an adaptation of the bestselling novel The Art of Fielding. His action-comedy Stuber sold to Fox for the mid-six figures. Dave Bautista (Guardians of the Galaxy) and Kumail Nanjiani (The Big Sick) starring. Releases July 12th, 2019. In 2018, Script Pipeline contest winner The Standoff at Sparrow Creek (formerly Militia), written by Henry Dunham, premiered at the Toronto International Film Festival. Henry made his directorial debut with the crime-thriller starring James Badge Dale (Iron Man, Rubicon). Standoff released January 18th, 2019. Kendrick Tan (Lit Entertainment Group) signed Henry a few weeks after he was announced as the winner of the competition, with UTA following suit. Script Pipeline Screenwriting Competition winner Evan Daugherty selling Snow White and the Huntsman to Universal for $3 million and later taking the lead on studio films Divergent, Ninja Turtles, and the upcoming Rose Red from Disney. Evan was previously attached to write the limited series Esmeralda for ABC Studios, GI Joe 3 for Paramount, an adaptation of Myst for Hulu, and the Tomb Raider reboot. His contest-winning script Killing Season (formerly Shrapnel) was produced and starred Academy Award-winner Robert De Niro and John Travolta. Script Pipeline Screenwriting Contest finalist Jen Goldson saw her romantic comedy Off the Menu produced and released in 2018, starring Santino Fontana (Crazy Ex-Girlfriend) and Dania Ramirez (Devious Maids). Jen was introduced to director Jay Silverman at a Script Pipeline event—the screenplay went into production in less than a year. She has two other features in production, including her contest-placing dramedy Everything’s Gonna Be Okay, Andy Tennant (Hitch) set to direct. Micah Barnett, whose work was developed through Script Pipeline’s Workshop, sold The Rabbit to Warner Bros. for six-figures and a TV pilot, Ricochet, to NBC. Screenwriter Brian Watanabe had his Script Pipeline “Recommend” action-comedy Rogue’s Gallery (later titled Operation: Endgame), also initially developed by Script Pipeline, produced by Script Pipeline’s Chad Clough and Sean McKittrick (Get Out). The film starred Zach Galifianakis (The Hangover), Adam Scott (Parks and Rec), Maggie Q, Ellen Barkin, Bob Odenkirk (Better Call Saul), and an ensemble cast. The Devil in Evelyn, winner of the First Look Project (Teleplay), was picked up for development by Mandalay Pictures. Script Pipeline set up the co-writers, Ben and Tyler Soper, with meetings after extensive circulation to industry. From 2017-2018, Howard Jordan Jr., runner-up in the Script Pipeline TV Writing Competition with the comedy Family Be Like, was staffed on the CBS series Superior Donuts. His first solo-written episode aired in January 2018. Outside of its own writer successes, Script Pipeline’s first produced film, The Living Wake, starring Academy Award-nominee Jesse Eisenberg (The Social Network) and comedian Mike O’Connell (Dr. Ken), received high praise when it made its festival debut in 2010. A number of original feature and TV projects are in various stages of development, and over 150 writers have found representation, had their scripts optioned and produced, and seen their careers launched as a result of facilitation. 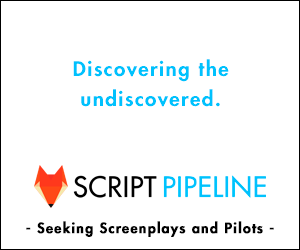 With a constantly expanding industry network, Script Pipeline searches for new material on a daily basis–and reviewed over 15,000 screenplays, pilots, and original pitches in 2018. *Industry requests to review material from Script Pipeline writers can be made here. Mark Mahon, Writer/Director (Strength and Honour)Script Pipeline "Recommend"
Colin CostelloScreenwriting Contest Finalist and "Recommend"
Romi MoondiScreenwriting Contest Finalist and "Recommend"